Then a small furry biped--trusting, appealing, and ridiculously cute--shows up at Jack's outback home. Followed by its family. As it dawns on Jack that despite their stature, these are people, he begins to suspect that ZaraCorp's claim to a planet's worth of wealth is very flimsy indeed...and that ZaraCorp may stop at nothing to eliminate the "fuzzys" before their existence becomes more widely known. Q: Why Fuzzy, why now? A: Mostly because I thought it would be fun. 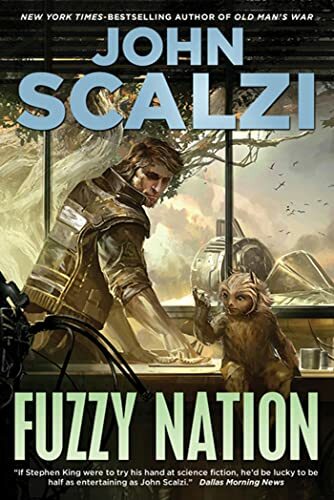 I wrote Fuzzy Nation when I was between publishing projects, mostly for my own amusement, and not as something I actually intended for publication. It was only after it was finished that my agent said "Hey, I could work with this," and started the process of getting it published. That said, any time is a good time to help people make the acquaintance of the fuzzies, and of H. Beam Piper, the author who originally thought them up. Q: How are Fuzzies different from Ewoks, Plushies, and Softies? A: I think they're smarter and more complex than, say, the Ewoks, who are basically just furry cavemen. I think in both Piper's tale and my own, the motivations of the creatures aren't always obvious or straightforward -- they can be devious for their own ends when it suits them. They're more than just adorably marketable teddy-bear-like objects, which is one of the reasons for their longevity. Q: H. Beam Piper probably isn’t a household name to the new generation of SF/F fans coming up. Thinking back to your reading growing up, who else would you recommend that might not be hugely known these days? A: In science fiction, I was a fan of Keith Laumer starting in my high school years; a number of folks see similarities between what Laumer was doing and what I do, especially in "The Android's Dream." Laumer had a sense of humor, and of irony, and a really nice way of getting across the fact that even in the future, some things will be absurd. Q: If this is Fuzzy retro-fitted for the 21st century, what should we expect that’s the same and what’s different from the original Fuzzy fiction? A: What's the same: The very general plot line and the name of the main human character (and the name of the main Fuzzy). What's different: The actual character of the main human character. My Jack Holloway is substantially different from the one Piper had, and many if not most of the changes between the two books stem from the differences between those characters. It makes for a fun compare and contrast. Q: What did the book allow you to explore that you haven’t in your other fiction? A: It allowed me to explore how another writer solved the same plot and character issues that I was encountering, because our tales were naturally so very similar. This was the writing equivalent of walking a mile in another writer’s shoes. Piper and I are different writers and I made different choices than he did in many places. But every change was another opportunity to walk with Piper and to learn a little from him. It was a very interesting experience. Q: In what ways was Fuzzy Nation fun to write and in what ways was it hard work? A: It was fun to write because it was no pressure--since I didn't initially intend to sell it I didn't worry about the commercial prospects of what I was doing; I just focused on the pleasures of writing for the sake of writing. It's an exercise I recommend every writer do from time to time. How it was hard: For many reasons, the contracts and business end of this novel were more complex (and sometimes more annoying) than it usually is with books. That was a lot of work to sort out. Q: Do you have a favorite scene or situation in the book? A: I like when Jack Holloway first meets a fuzzy. I play the scene for laughs in many ways (there's even a little bit of slapstick), but at the end of the day it's very much a "first contact" scenario, even if Jack doesn't know if this creature he's discovered is actually smart or not. Either way, it's new beginnings for both Jack and the fuzzy, and that's always a fun thing to work out in words. Q: What’s up next for the Scalzi Juggernaut? A: The Scalzi Juggernaut will continue to power through its tour, which ends in Phoenix in the end of May, and then it is going to spend a little bit of time doing nothing but relaxing with family and friends. Then polishing the novel slated for 2012 (already completed but not yet edited), and prepping the 2013 novel, not yet written. There are worse ways to live a life.